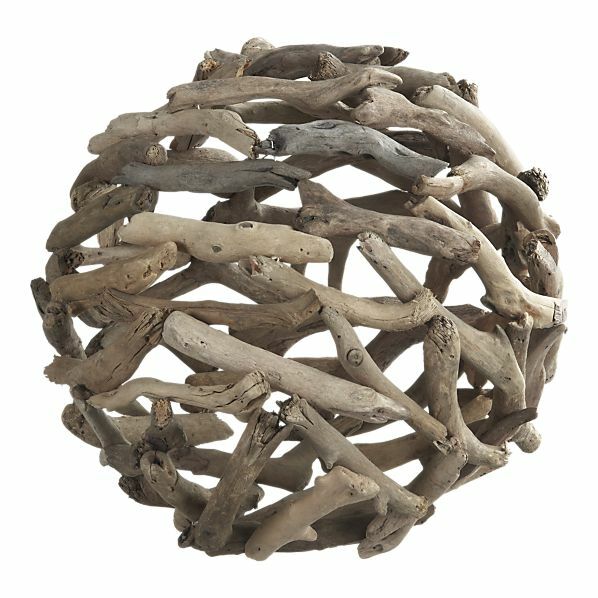 I was walking through Crate and Barrel a while ago and this driftwood ball caught my eye. (If you don't already know, I am obsessed with sphere shapes which you can read about here). I loved it and I thought it might be fun to try making one on my own. Since we don't live near the beach, and our house is surrounded by way too many trees, I decided to use what was right outside my door--branches and twigs. 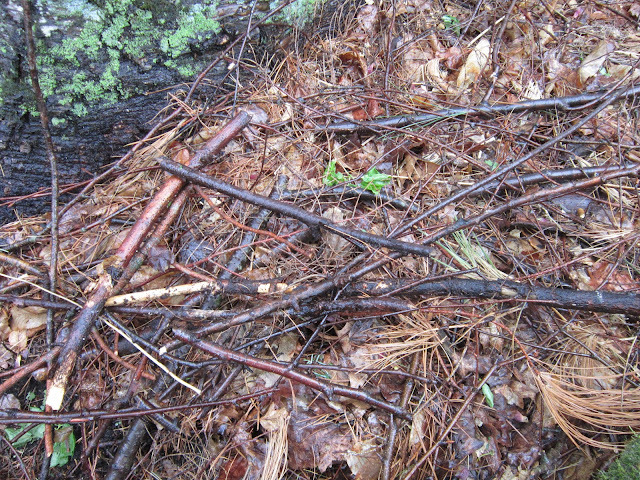 After I collected an armful of sticks I broke them up into about 3-inch pieces. I bought a good-sized inflatable beach ball to use as the foundation. Using a hot glue gun, I started covering the ball with the pieces. 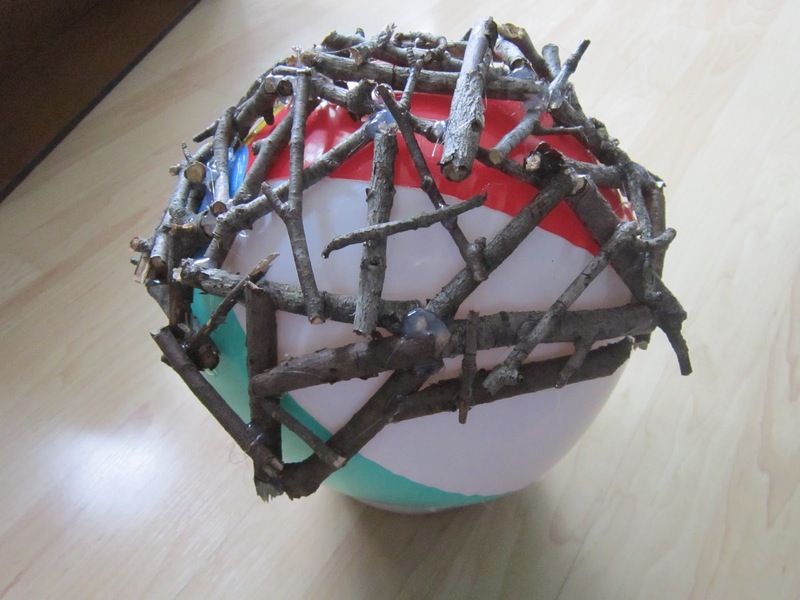 Be sure to glue the sticks only to each other and not to the beach ball so it can be easily deflated and removed at the end. When I would accidentally have a big blob of glue I just covered it with a smaller twig. It took me several evenings to complete but now it's done and I love it! Here is yet another sphere to add to my collection, and I love to incorporate outdoor elements indoors--it really breathes a lot of life in to a room! Hi Rita, I found you through I Should Be Mopping the Floor's Monday party. Oh my goodness, I love that you just did this yourself! How perfect. Isn't it a great feeling to just go out and pick up some sticks and make something so pleasing to the eye and that adds to your decor. How rewarding! I think I'm gonna have to try this. I don't have as many great trees for twigs, but I'm sure I can find enough in time. Great idea! Hope you'll come by and visit me at my place sometime too. Thank you...good luck with yours! This is ingenious truly... what a lovely way to spend a few hours... I have a glue gun and will definitely try this out. It can also be done with wool and glue over a balloon. Thanks Jennie...I'll link up to your party, too! Thanku Rita for taking the time to link up! There are some wonderful tutorials out there. Be sure to come back next Sunday maybe and share again or at least browser and say hiya. I've pinned your creation to my Sunday School Pinterest Board if that's ok with you? Very well done! I will put this on my crafting "to do" list! Thanks for taking the time to write Mitzi! Good luck with yours. amazing! so glad you were able to make this yourself. display it proudly! Thank you--it has a special place where it fits perfectly! 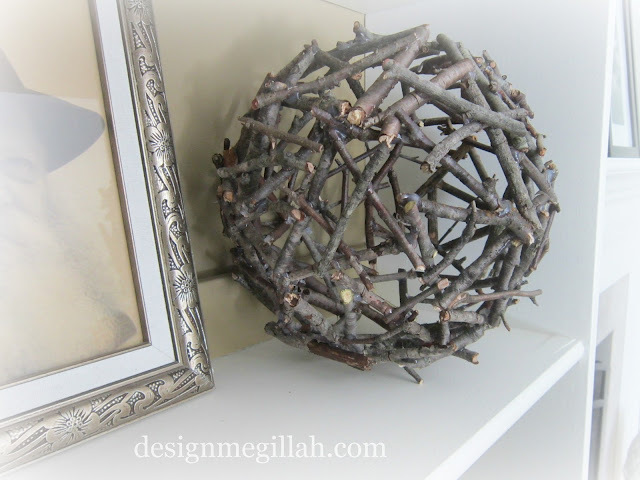 Thanks so much for sharing how you made this wonderful twig ball, Rita! I just love it and have "pinnned" it over on my Pinterest board so I won't forget how to make it. I saw your post over at "Not just a Housewife". I am following you now. Thank you for pinning and following!! love it Rita, fabulous idea! And using a beach ball, genius! thanks so much for sharing on Craft Schooling Sunday! Hmmm...white sticks sounds interesting. Send me pics! Rita, This is a wonderful project and I too love spheres of all types. I have been collecting them, and making them for years. I too have posted about this obsession. Here is a link to my first post about the collection. Last summer I made a series of seven large outdoor spheres from concrete. It was a greta project. We used beach balls also but got one that is 4 feet in diameter! Here is a link to photos of them and there are additional links on the page to the step by step directions. And just last month I used the technique you demonstrated for creating a centerpiece bird's nest out of driftwood. I did a tutorial of that project here. I need to go and explore more of your blog to see what else we have in common. Thanks for sharing! I LOVE your concrete balls! Maybe I'll try these. I see we do have a lot in common...I also live in Connecticut and have a BFA from The Columbus College of Art and Design. Thanks for writing and I will stop by your blog, too. This is wonderful. It turned out so great. I just love that you used what you had on hand! Great job! Love love love this! I also have a sphere obsession and I'm running out of display spaces. Looks like I'll have to rotate them. Such a creative and smart idea, thanks for the how to post! Thank you! You have fabulous taste so coming from you is a real compliment! I love this! I found your blog via HoH Link party and I think I'm going to make a bunch of these. I live by both the ocean and the forest, but I like yours better so I think I'll stick with sticks (haha...) Thanks! Thanks Sarah--I would have made the driftwood if I lived near the ocean! Good luck with your project! I LOVE THIS!!!!!! oh my , so simple and yet soooooo special and unique! I WILL BE making one, thanks to you!! pinning this NOW! Thanks Andrea...and thanks for pinning! Visiting from HOH. This is fabulous! It looks simple, and yet so striking. Thank you so much for sharing. Thank you for sharing this great tutorial! I found you on Pinterest and featured you on my Pinterest Picks. I would love for you to stop by and grab a feature button! I actually like your version much better! I think the Crate & Barrel version looks too deliberate for the natural elements it's using, so nice job! Thanks--it's nice when you can use local materials (free, too)! I'm visiting for the first time, and just love this twig ball. There's something so alive and mysterious about it. I'm going to make one! Thank you for the clear instructions. I too love spheres. Wonderful! Thank you so much , as I am obsessed with twig balls, I will be blogging this and your post shortly. Great post, thank you for your indephth explanations! I know this was written a few years ago,if you do catch this I was wondering if I could make this as a hanging light for my bedroom? Would it be safe if I painted it or should I put some sort of (if there is a thing that exists) flame retardant on the twigs to protect it from catching on fire, if it is flammable? Hi Nena, I suppose you could make this into a light fixture, but it can be a bit heavy depending on what kind of twigs you use. Yes, you could spray paint it, but I don't think there's anything to put on to make it fire retardant? Good luck! Aside from deflating the beach ball, I used an x-acto knife and cut it up in pieces to get the ball out. Yes, a little glue got on the ball but no biggie.